The analysis of DNA involves different types of molecular experiments and biological procedures. DNA is a fragile and complicated raw material, so handling and analyzing it requires the best quality and purest preparation of chemicals. Depending on the analysis, hundreds of chemicals, from acidic and basic solutions to buffers and dyes, are involved in the study of DNA. 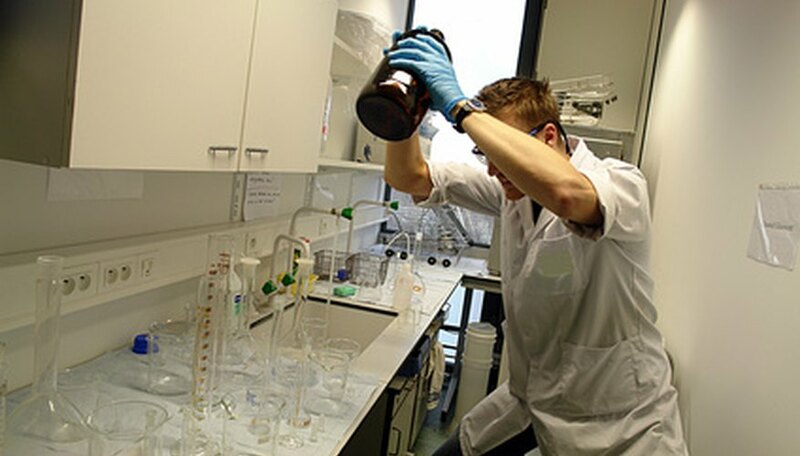 Understanding why some chemicals are used is key to performing successful experiments and obtaining accurate, reliable and reproducible results. Three types of DNA are purified for scientific work: DNA from the genome (genomic DNA), the entire DNA from the cell (total DNA) or from plasmids, which can self-multiply. Total cell DNA purification uses chemicals that allow the destruction of a cell's many membranes during cell lysis. The chemical ethylenediaminetetraacetate (EDTA) is often used to take away magnesium ions, which are required for maintaining the rigidity of cell walls, causing these to weaken to the point that they collapse or tear, releasing the cell's contents and DNA for analysis. In addition, EDTA protects and preserves the integrity of DNA by inhibiting enzymes that are normally present in the cell, which can fragment the DNA and render it unusable. The polymerase chain reaction (PCR) is a sophisticated analysis method used to amplify several thousand copies of a DNA molecule, however, it is fraught with technical problems and inaccuracies. Many scientists, therefore, routinely perform several different sets of PCRs to find the most optimal condition and parameters for a particular gene of interest. One chemical used to carry out such an optimization is magnesium, which stabilizes the DNA polymerase enzyme used in PCR and acts as an essential co-factor for the activity of the enzyme. For PCRs, magnesium is used in the form of a magnesium chloride buffer. Ethidium bromide is a dye that binds to DNA by slipping in between the nucleotides that make up a DNA double helix in a process known as intercalation. This dye can then be illuminated with an ultraviolet lamp, so that the DNA to which the ethidium bromide has been bound can be visualized. However, at least 1 nanogram of DNA is required for the ethidium bromide to be seen properly, therefore, it is one way of detecting PCR-amplified DNA. Although cheap and widely used, it is also a mutagenic chemical known to cause cancer, so its use in laboratories is highly regulated and many scientists are moving to using less toxic alternatives. MadSci Network: Why is DNA stained with methylene blue? Owyoung, Palmer. "Chemicals Used in DNA Analysis." Sciencing, https://sciencing.com/chemicals-used-dna-analysis-6869624.html. 25 April 2017.